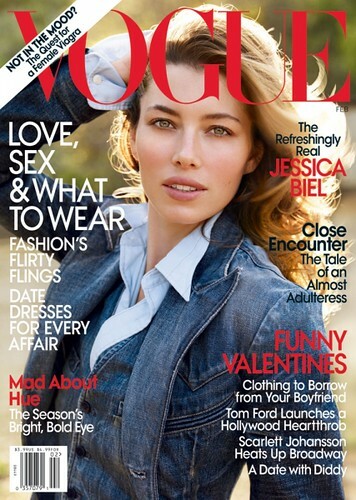 Just quickly interrupting your slipper-clad, work-from-home day (hopefully) to mention how much I love the February cover of Vogue featuring Jessica Biel. She looks so fresh-scrubbed gorgeous that I took pause to stare when it arrived the other week. Just when I start to feel like Vogue is settling into a self-congratulatory magazine rut, they surprise me with a fresh, perfectly executed angle, theme, or photoshoot that makes me fall in love with the magazine all over again (anyone else love the November Green issue?!). The shoot manages to achieve something more personal than your typical actress-promoting-a-movie-and looking-pretty spread, reflecting both her public persona (all forties-era Hollywood glamour with Veronica Lake inspired waves and elegant dresses) and her private, “real” life (on a ranch in California, she wears denim, very little makeup, and as we see in the behind-the-scenes video, displays genuine girl-from-Colorado chill when a rooster shits on her back). Any girl who struggles to reconcile her many sides will appreciate and relate. Seems to me that Biel would be the ideal face for an upcoming Ralph Lauren campaign. Then she could ditch the Revlon deal, which has her looking too tarted-up anyway. Seems like Anna agrees, from the tone of her editor’s letter. And whatever Anna wants…. site provided by route 7 media. original css coding by brian gardner.